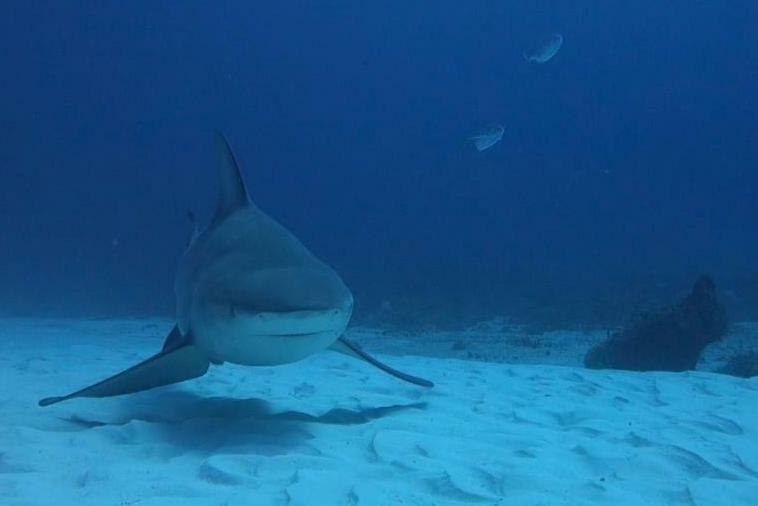 Bull Sharks have baffled scientists for many years by thriving in both saltwater and freshwater alike. The name Zambezi Shark bears testimonial to this as they have been found many hundreds of miles up the Zambezi River, as far up the River as Kariba Dam wall, before the Cahora Bassa Dam was built in 1974. 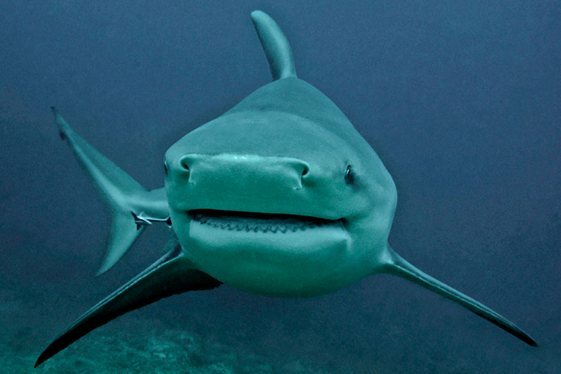 Hence the local name of “Zambezi Shark.” The Bull Sharks ability to move freely between habitats of such wide-ranging salinity is an impressive physiological feat. It is probably not a permanent freshwater resident but appears to migrate between saltwater and freshwater, which makes it all the more astounding. 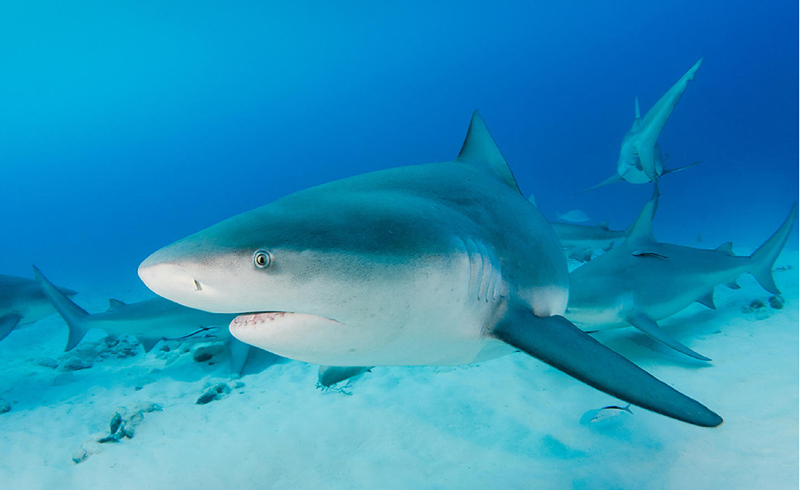 Bull Sharks are found mainly in sub-tropical to tropical waters, virtually worldwide. They prefer shallow coastal waters, including beaches, lagoons, and bays. It is the only shark known to penetrate far into freshwater. 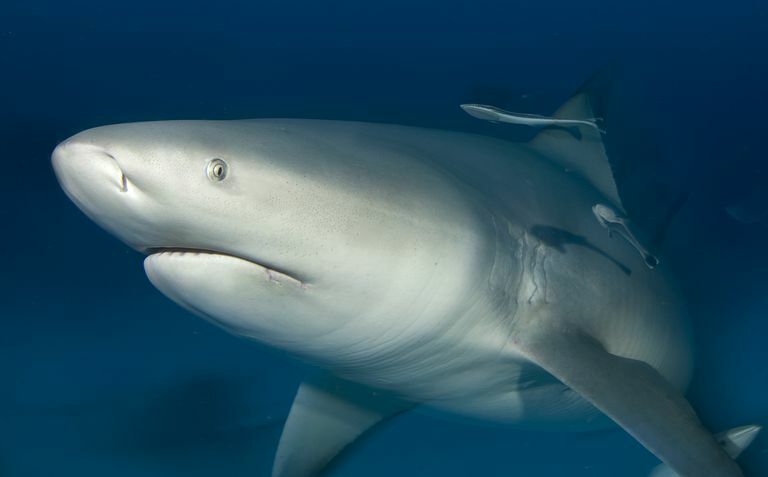 The Bull Shark is considered one of the four sharks responsible for most attacks on humans (the others being the Great White, the Oceanic Whitetip, and the Tiger Shark) and is potentially one of the most dangerous sharks in tropical and sub-tropical waters. It is large and powerful, very common, and its willingness to enter murky, muddy water gives it ample opportunity to encounter people. 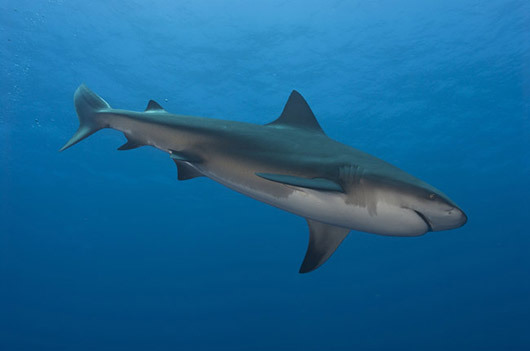 The Bull / Zambezi Shark is widely believed to have been the culprit in some shark attacks attributed to other shark species. They are regularly encountered by divers in South African waters with no reported incidents. They are viviparous, giving birth to between 1-13 pups. Their diet consists of mainly bony and cartilaginous fishes, but also crustaceans, turtles, birds, dolphins, and marine mammal carrion. 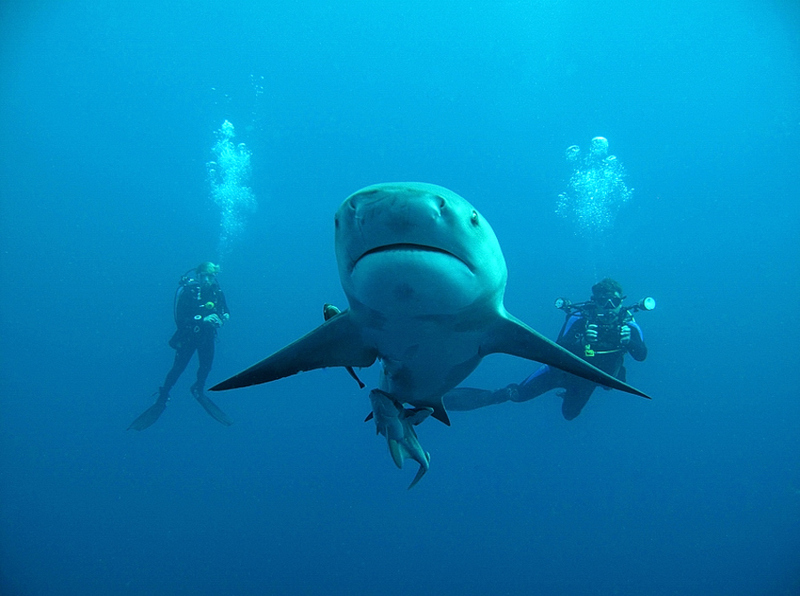 A Bull / Zambezi Shark dive is very similar to a Tiger Shark Dive, the seasons also overlap. November to July. When on a baited Tiger Shark dive you are only likely to get a few Tiger Sharks that will stay around for the duration of the dives, whereas on a Bull / Zambezi Shark baited dive you are likely to have anything between from between 5 and up to 15 sharks at any one time. 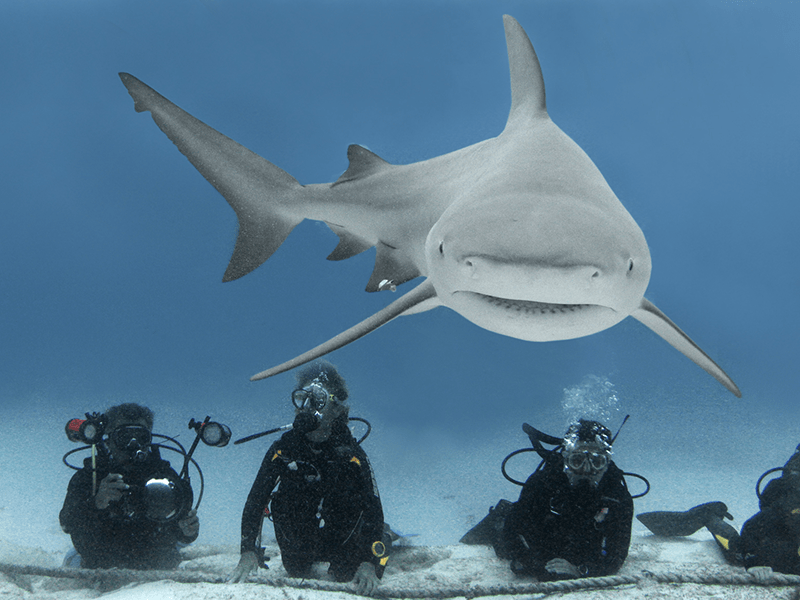 Bull / Zambezi Sharks, like all sharks, are very cautious creatures, but once they have gotten used to the divers and their bubbles they allow the divers to get “up close and personal”. An experience never to be forgotten. 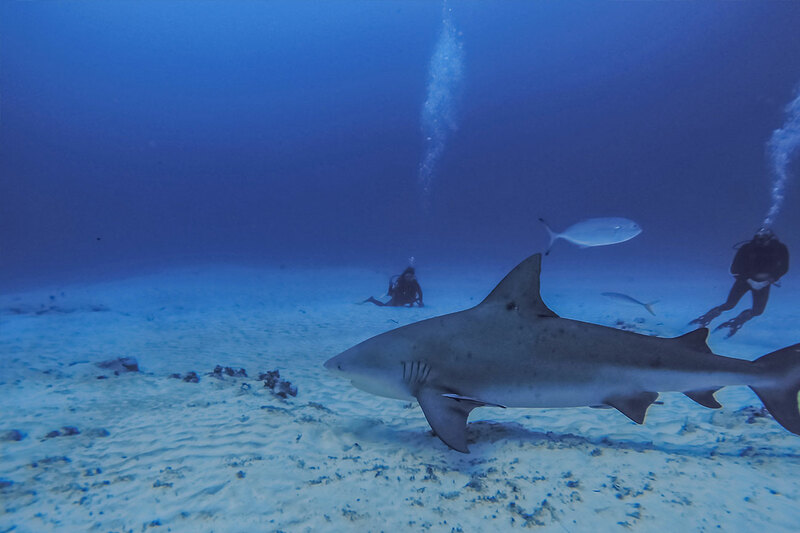 The best months to experience Bull / Zambezi Sharks on Aliwal Shoal and Protea Banks is from November through to July, but Bull / Zambezi Sharks have been encountered at both dive sites year round. But if its specifically Bull / Zambezi’s that you wish to dive with, plan your trip for November thru July. 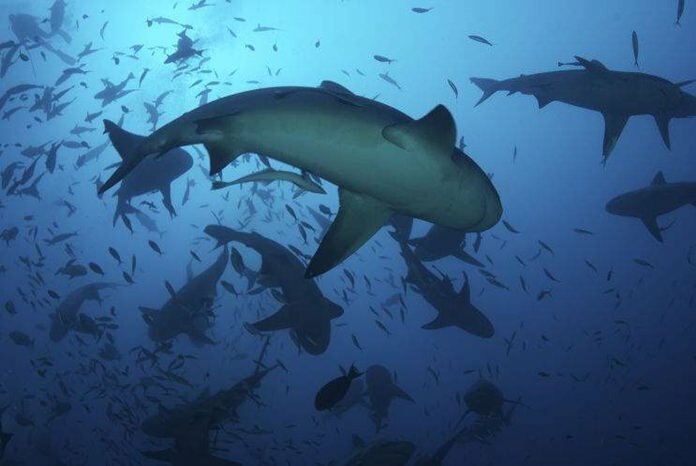 How Do We Dive With Bull / Zambezi Sharks? It inhabits the warm, nearshore waters of Mozambique and KwaZulu-Natal; rarely enters Cape waters. It may be found in many large rivers and lakes far from the sea; estuaries such as St. Lucia and Richards Bay form nursery grounds for the juveniles. Females mature at 193 cm (21 years) and males mature at 190 cm (20 years). Breeding takes place north of the Tugela River; placental viviparous development. After a gestation period of just less than 1 year, 10-12 pups are born in summer at 50 cm. This species may attain a length of 240 cm. Equipped with triangular cutting teeth and a wide mouth, it has a broad food spectrum. Rays, guitarfishes and small sharks have favoured prey items together with a wide variety of fish. It scavenges in the vicinity of flooding rivers. It is extremely dangerous and is responsible for many shallow water attacks. It is one of the few sharks able to survive for long periods in fresh and muddy waters. This slow-moving shark adapts very well in captivity. 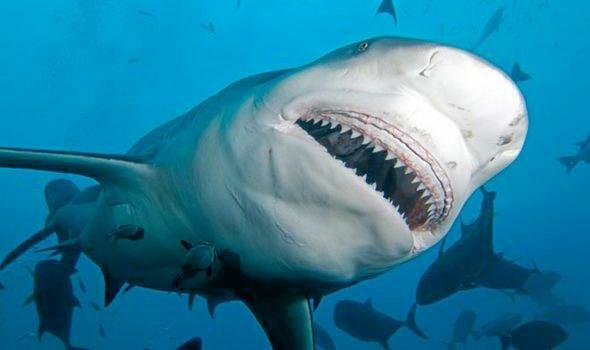 Elsewhere in the world, this species is known as the bull shark (USA) and the whaler (Australia). Years ago we started the surface work a la’ the Great White Shark cage diving, but without a cage, and it has been very successful, and other than breaching we are getting all the other behavioural stuff that they get with the Great Whites in Gansbaai / Simon’s Town. Once we arrive at the dive site we start chumming so as to attract the Bull / Zambezi’s and put out a buoy with the bait. When the first Bull / Zambezi’s appear the DM assesses the situation and if he is of the opinion that the sharks are going to stay around awhile and that they are not aggressive the divers may enter the water. Either you can view the action from the “safety” of the boat, or for non-certified divers, on snorkel. Certified divers drop down to about 5 meters and follow the action from below. This is a drift dive as the boat, chum and bait is drifting with the wind and surface current, as are the divers at 5 meters. 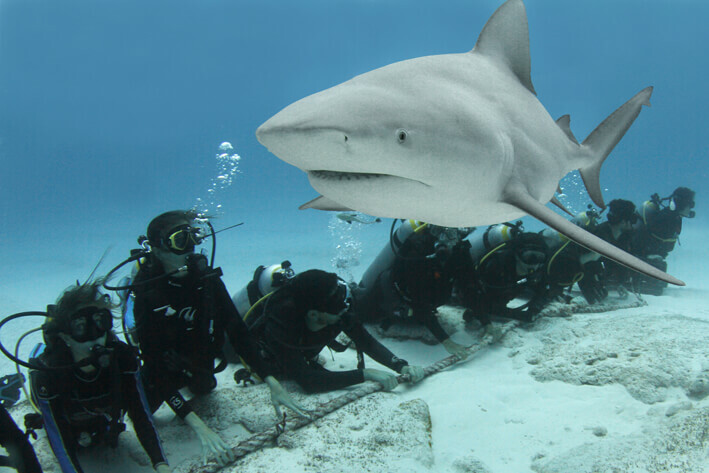 Should the sharks disappear the snorkelers and divers climb back onto the boat and we move to another location and start all over again. The typical visibility is from 5 to 40m and water temperature between 22 and 28 Celsius depending of the time of year. Daytime temperatures range from 20 to 38 Celsius. 9h00-Meet on the beach to kit up. 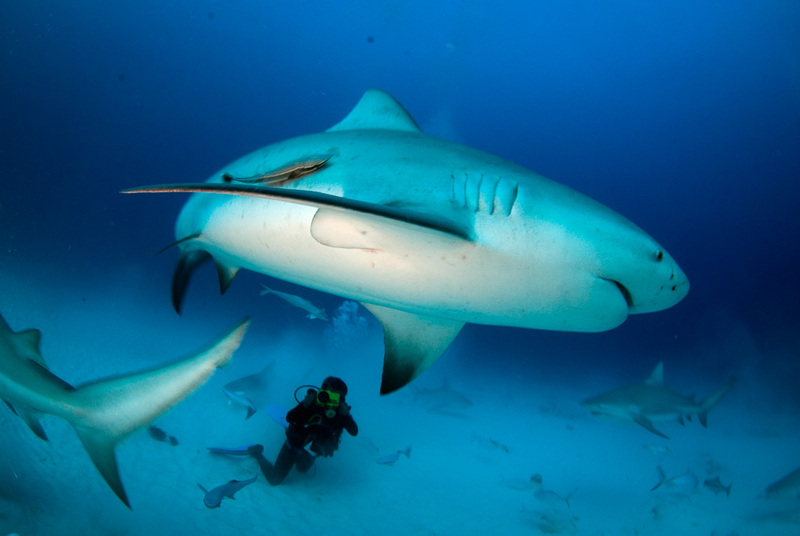 The likelihood of encountering a Bull Shark when on a diving safari to South Africa?